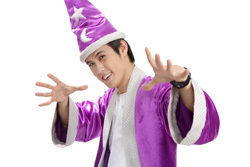 Currently one of the most popular kids’ performers in specialty toy stores, the Wacky Wizard is a big hit with children island-wide! Dressed in his long, magical flowing robes, he brings with him an air of excitement and enchantment to every party he visits. Witness his mind-boggling, yet child-friendly and highly amusing magic acts in the compounds of your very own home! Watch closely as he creates pocketful of miracles in front of your eyes! As a former high school student leader, his energy level and enthusiasm never fail to inspire his children audience to revel in the magic of the moment in each and every show! It is of little wonder that the Wacky Wizard, or what some children purposely but affectionately mis-call “The Wacky Lizard”, is such a close and likeable friend to many kids in Singapore. A wonderful opening act where the Wacky Wizard displays his dexterity and skills using different amazing magical props! Witness a long pole seemingly appear from thin air as well as a rendition of the classic Chinese linking rings performed to high levels of precision! One of Wacky Wizard’s educational routine. He claims to have brought a bottle of apple juice for the birthday child but instead produces a bottle of beer by mistake! He proceeds to explain and educate of the ills of drinking and finally gets the children to cast the magic together in order to vanish the bottle into thin air, along with some comedy! Toothache is a highly interactive routine where the Wacky Wizard gets the audience to participate in some hilarious magic. The act involves a production of multiple strings of beautiful rainbow coils and eventually a surprise ending with the appearance of a cute giant tooth from the mouth! The kids simply love this! A magical and visual act where the Wacky Wizard produces a shower of hearts magically for his audience!